When it comes to creating jewellery, I often know how I want to use a string of beautiful gems in a necklace the moment I see them. Something about the colour or the shape inspires the piece, as was the case with this three-strand onyx bracelet, with the sterling silver beads. At other times I have a necklace or a bracelet in mind (vaguely) and I’m keeping an eye out for a stone that fits my idea. In that case, a particular size, cut, or colour is what I’m after. And sometimes I sit down to work and look at my raw materials and I come up blank. I can try working, but I’ll end up unstringing everything I put together because it is just… crap. When this happens, I’ve learned to recognize that the well has gone dry and I need to refill it. That’s what I call that moment when you’ve been putting out so much effort that you can no longer come up with anything – let alone anything good. Sometimes it means I need a vacation, but often it means I need some creative inspiration. So it’s off to Vancouver’s art galleries for me. I’ve always spent a lot of time at the Vancouver Art Gallery, but I also catch shows in the many commercial galleries, which is where I found Bobbie Burgers luscious botanicals. 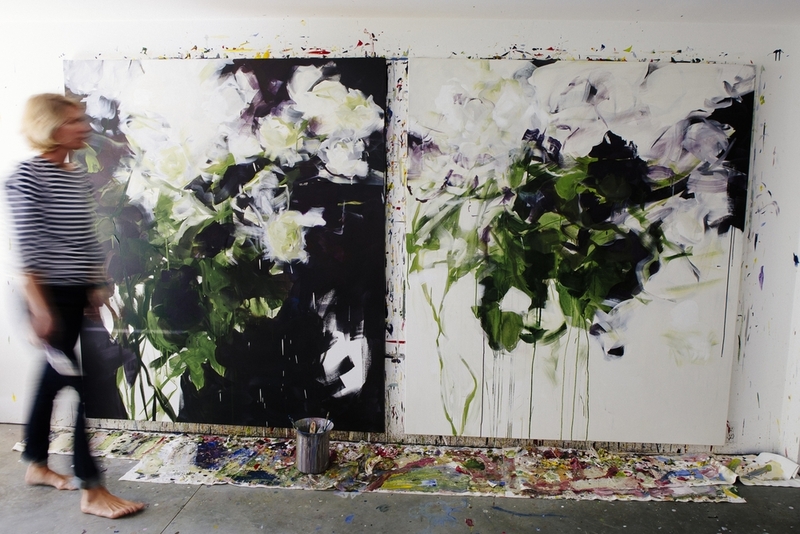 I adore her florals on huge canvases. Often, her richly coloured blossoms seem to blow in the breeze, giving a nod to the French impressionists and their fields of fleurs. 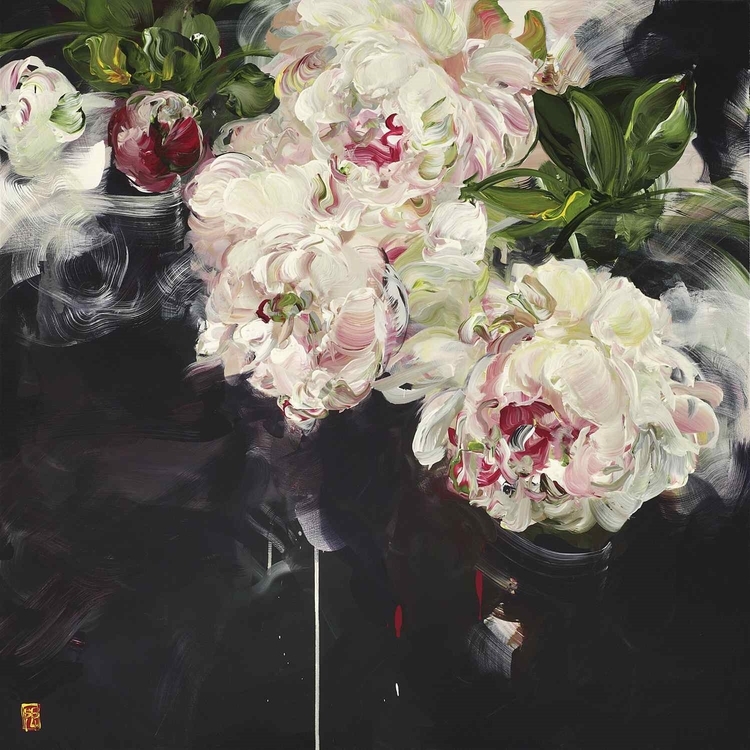 In other works, her abstract suggestions of a bouquet are reminiscent of still lifes, but with a modern twist. 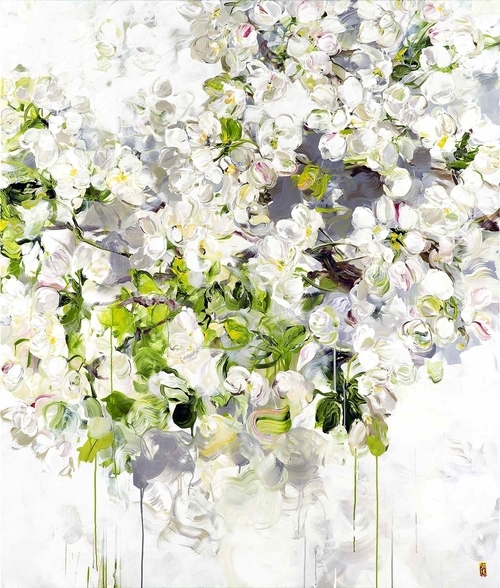 She often paints white flowers, which I love, and it’s easy to get lost in her huge canvases. She produces the sort of paintings that are easy to live with, if you have the wall space. Most of the works I’ve seen have been more than 2 metres high and some dwarf the artist. There’s a hint of the French about her work, so I was delighted to discover she’s a local artist who studied in France. Burgers’ work is often part of the Arts Umbrella Splash fundraiser, to which I donate a necklace every fall. And if you have the walls to wear to them, her paintings are just a joy.